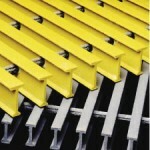 Pultruded Fiberglass Grating is the long-lasting solution for rugged applications. M ost types of metal grating have considerable down-sides; they corrode, wear down quickly, cause maintenance headaches and downtimes, and are costly to install. Fiberman sells high-strength pultruded FRP bar grating which can be designed and used like traditional metal grates, but with all the many benefits of fiberglass. FRP grating is especially useful for replacing steel grating or aluminum grating in corrosive environments or where other types of gratings require frequent replacements. Have a look at our Grating Selection Chart for an overview of the most common profiles. You can also cut FRP grating yourself. See how easy it is, with our online video: How to Cut FRP Grating. Contact us for complete load tables and properties for any profile you are interested in. We can also profile you with advice on the best profile for your application. Standard panel sizes have 3′, 4′ and 5′ widths and 8′, 10′, 12′ and 20′ lengths. Custom panels sizes are also available. Pultruded Grating can be made to exact sizes to eliminate waste and fabrication costs in the field. The maximum panel weight is 500 lbs. and the maximum panel size is 60″ x 240″. FRP Grating panel hold downs are used to keep grating panels stationary. There are three types of grating clip for fiberglass grating. Weldable 316L stainless steel saddle clips are available for all grating series except T-1800 and T-3500. *Bolts are priced separately from the saddle clips. Weldable 316L stainless steel insert clips are available for all grating series except T-1800 and T-3500. *Bolts are priced separately from the hold-down. FRP Grating Panel Connectors are generally only used at midspan to assist in transferring load from section to section. See the diagrams below for recommended configurations. There are three types of panel connector grating clips for fiberglass grating. 316L stainless steel saddle clips are available as panel connectors for “I” and “HD” bar grating and T-bar grating except T-1800 and T-3500. Insert clip hold-downs are available for I-bar grating and T-bar grating except for T-1800 and T-3500. Pultruded Fiberglass Grating is excellent for use in heavy traffic areas, such as outdoor walkways on drilling platforms, in WWTP water treatment plants, in livestock facilities and anywhere you require secure and durable walking surfaces. Pultruded Fiberglass Grating comes with anti-slip surfaces as an important safety feature in walkways where moisture is present. Pultruded Fiberglass Grating has a large open area, and is not comfortable for bare feet. We recommend Pultruded Grating for any place that people will be walking in bare feet, such as waterparks or swimming pools. Discuss the specific needs of your project with one of Fiberman’s Pultruded Fiberglass Grating experts. We will ensure that the material you select will have the specifications required for safety and optimum performance. You will also benefit from our industry-leading quick quote turnaround and fast delivery across Canada and the US. 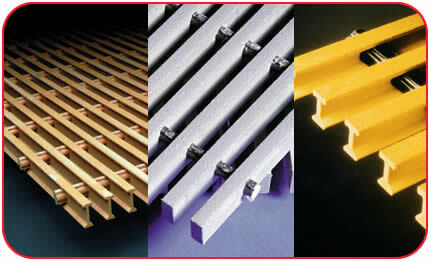 For all Pultruded Fiberglass Grating inquiries, please call 1.844.599.0260 or email sales@fiberman.ca or Request a Quote. Fiberman’s headquarters in Western Canada stocks many Pultruded Fiberglass Grating dimensions, ready to ship across British Columbia, Alberta and all provinces in Canada. We have daily shipments from Vancouver to destinations including Edmonton, Calgary and Fort McMurray. For our US customers, we ship from distribution centers in: Pittsburgh, PA; Houston, TX; Knoxville, TN; Rochester, MN; Salt Lake City, Utah; and Orlando, FL. Fiberman’s pricing and service experts are standing by to help to find the best product for your project. With many varieties in stock and expedited shipping, we can supply your project with Pultruded Fiberglass Grating at the best possible price with fast delivery.